Beer bottles clink in the background as the sponsors pack up their signs and tchotchkes. (How do they fit everything back into those cartons?) A girl bounces a balloon between her hands using her teeth before losing it and flailing over the couch to retrieve it. It’s been three days of community building. Three days of learning. Three days of motivating keynotes. A water park party. Hours of board gaming. And 7 meals with plates piled high. All topped off with freshly roasted marshmallows (over real fire!). I want to add my thanks to the chorus of gratitude for the sponsors for supporting this community and for the organizers for pouring their time and energy into making That Conference a success year after year. You can learn technology online but you can only connect with other humans face to face. The interactions at open spaces and over meals only happen at a conference. Ideas are sparked, plans are hatched, and friendships are formed. There are businesses and technologies that owe their existence to these events. I’ve had the pleasure and honor of presenting twice so far at That Conference. In 2015 I tried to raise awareness of the challenges facing women in tech. That session ended with a conversation among the participants on how they could change their environments to be more welcoming. The next year an attendee tracked me down to explain how he’d taken the information to heart and reconsidered how his actions affected women in his workplace. I consider that a small step in the right direction, but I was thrilled to see That Conference bring even more attention to the issue. This year Hilary Stohs-Krause gave her keynote on the third day of the conference. She told the depressing story of how women, who began and dominated computer programming in its infancy, have been driven out by the patriarchy over the past decades. She recounted poignant snubs such as celebrating men’s hardware achievements with a banquet while sending the women programmers home in a snow storm. She reminded us how once men invade a field, its salaries and prestige rise as women are pushed out. Cognizant of how important it is for girls to see successful women in technology to visualize their opportunities, Hilary Stohs-Krause took the time to recount legendary women of computing past such as Ada Lovelace (the enchantress of numbers), Grace (that moth was a bug) Hopper, and Dorothy (the boss) Vaughn. She continued to list change makers past through to present day women who are both technology luminaries and fighting for social justice. The keynote ended with a call to action. Listen to and amplify the voices of women in technology. Provide them megaphones by selecting them to speak in meetings, at user groups, and at conferences. Attend their talks. Echo and support their words and ideas– with credit. Use your power and privilege. (Perversely, it actually helps you as much as it does them.) And remember, silence is tacit approval of systems of oppression. Speak out. Act. It was refreshing and energizing to see these messages on the main stage of a big conference. It needs to continue. I implore and expect That Conference to continue showcasing the struggle of marginalized groups in future years. I look forward to another keynote on diversity and inclusion in 2018. After all, the conference is explicitly for the community, and combating the harm of under-representation is a service to that community. It seems almost base to talk about my contributions at this point, but I wanted to highlight some of the positive energy I’ve experienced this year. I had a blast giving my talk this year on refactoring monolith database stored procedures, and it seems to have hit a chord. A handful of people tracked me down to thank me and describe how it has inspired them to make changes to their database environments. It’s a great feeling to have helped someone. And finally, I convened an open space this year on Local User Groups. We discussed a variety of ideas on sponsorship, speakers, location, timing, theme, and even umbrella insurance. But more importantly, two people have plans to start groups in their communities, and I’d like to think we moved the needle on growing the technical community again here at That Conference. So thanks again to everyone who makes this happen, including the attendees who come with an open mind and get engaged in learning, growing, and building connections. 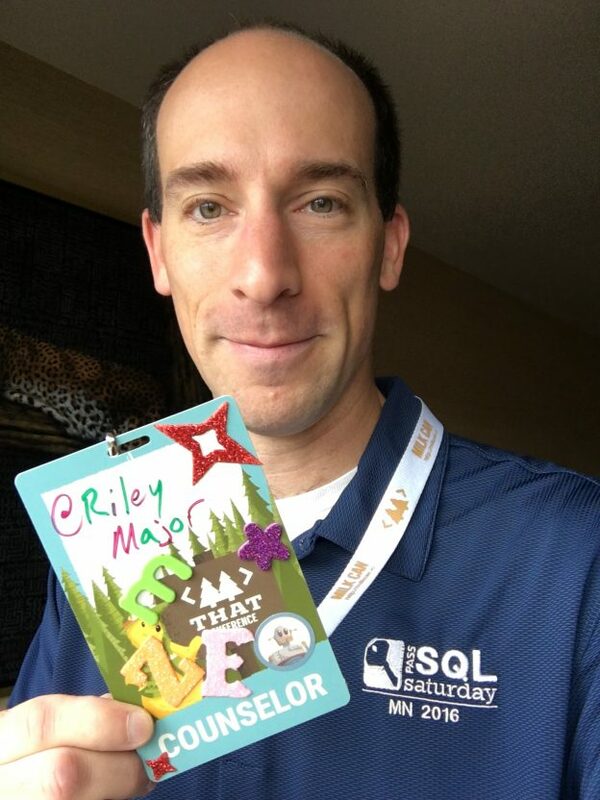 This entry was posted in Tech Community and tagged Conference, Diversity, ThatConference on 2017/08/09 by Riley Major.